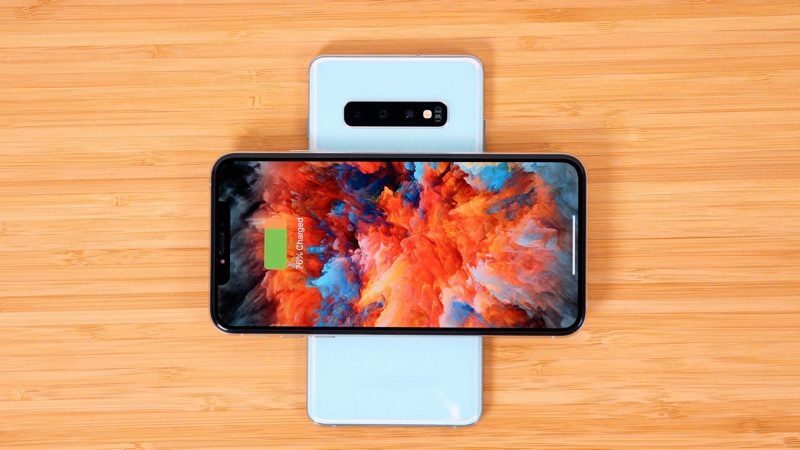 Apple's 2019 iPhones are going to have a two-way wireless charging feature that will allow the iPhone to charge other devices like the AirPods, Apple analyst Ming-Chi Kuo again confirmed in a report sent out to investors today. This is a feature that Samsung has already debuted in its 2019 Galaxy smartphones, and in those devices, it's known as Wireless PowerShare. Wireless PowerShare allows the 2019 Galaxy smartphones to charge other Qi-based accessories, including the iPhone. Let me propose a name for the feature: Since there are no wires and power goes through thin air...let’s call it... wait for it... “AirPower”. Brilliant huh? So what happens when you put 2 iPhone11's back to back? It's the equivalent of crossing the streams. Never ever cross the streams! There's just something wrong with that image. I wonder if they can work it to be a watch charger as well. That might be handy for travelers as the cable is a little annoying. Also, only some Qi chargers work with some series of the watches, so it's kind of a mess. Let me propose we stop posing the same story over and over again like we did with Airpower. That was wrong, this is just a guess and we don't need to be told 8 times it's coming but from someone else. I think everyone is burned out from the results after airpower. Apple has a long way to go before regaining a lot of our confidence in things. You are currently on a rumor site. They are going to post rumors. When 2 iPhone 11s like each other they get together in a special hug. And in 6 months you get an iPhone SE. This could be pretty cool. Charge your iPhone on a qi charger overnight, and put your AirPods on top. I don't think this would work as the coils on the back of the phone will need to be unobstructed by the display, meaning the back of the iPhone will need to be in contact with the Qi charger and unavailable for AirPods to sit on top. Although plugging the iPhone in and resting the AirPods on top would forgo the need for a standalone Qi charger. Charging a Watch and AirPods are really the only real practical use for this. Charging another phone would be too wasteful with a minimum of 40% of the charge being lost if this anything like Qi. A Watch and AirPods can be given a useful charge pretty quickly. Another phone, not so much. This seems like the most pointless feature to offer on a phone. Does anybody actually want this?? Why not just buy a wireless charger? It would be much quicker and more efficient. I don't see any valid use cases for this tech.